Despite a relatively dry start to winter across most of the state, recent precipitation has brought seasonal rain totals closer to average for this time of year. Much of Southern California is now near to slightly above average for the season to date; NorCal remains slightly below average. The same goes for Sierra Nevada snowpack, which is at around ~90% of average on a statewide basis–though by recent standards that’s a pretty solid reading. Recent storms have brought an assortment of active weather particularly to the southern part of the state; minor debris flows near recent wildfire burn scars, significant urban flooding, impressive accumulating hailstorms, and even funnel clouds have all been reported. But all in all, the recent wet weather has caused relatively few major problems in the process of bringing much needed water to the state. A series of 3 distinct storms will affect California over the next 4-5 days, bringing a prolonged period of significant precipitation to most of California. January, of course, is near the peak of the rainy season in this part of the world, and these storms do not appear to be especially extreme in most respects. Each will bring a period of moderate to heavy rain (and possibly very heavy mountain snow) to much of the state, with strong and gusty winds possible especially in NorCal (of a magnitude we’d expect to see several times per winter). There is still a bit of uncertainty regarding how strong these storms will actually be. Each will be associated with a respectably moist airmass and decent dynamics, although large-scale jet support looks pretty unimpressive for the most part. If the configuration of the jet stream becomes slightly more favorable than is currently indicated by the models, it’s possible that the Wed-Thurs storm in particular could become stronger than currently anticipated. There are hints of this in recent model forecasts, in which the late-week system may be associated with a moderate-to-strong atmospheric river. If that happens, precipitation totals in NorCal could end up higher and there could be some localized hydro issues, although this still does not appear to bring a significant flood risk to NorCal. For the most part, this storm sequence should offer more benefits (in the form of higher streamflows and snowpack accumulation) than hazards, especially in the northern part of the state where the projected precipitation would bring seasonal totals up to around average to date. The story may be a bit different in Southern California, though, and I’ll discus that in a bit more detail below. But the impact of this storm sequence might be somewhat elevated in Southern California for two key reasons. First, antecedent conditions are actually pretty wet–many areas have seen heavy precipitation over the past few days and soils are much more saturated than has been the case recently. Second, there are a number of very large and high-intensity wildfire burn scars in close proximity to major population centers–regions that will be susceptible to flash flooding and potential debris flows if rain rates are high enough (as appears plausible). Each of the three storms will bring the potential for localized flash flood issues in SoCal, but the biggest risk potential appears to be with the Wed-Thurs storm. This storm will likely be associated with the deepest moisture plume and highest rain rates, and will coincide with the greatest atmospheric instability/forcing and hence the highest possibility of intense convective precipitation/thunderstorms. This third and final storm of the series is also associated with the greatest uncertainty: recent model runs are depicting much less precipitation across SoCal (and more across NorCal) with this one due to a northerly shift in the jet stream and atmospheric river. Given the uncertainties regarding the landfalling latitude of atmospheric rivers in the 4-5 day range, I’d say that anywhere in the southern 2/3 of CA is still fair game. If the AR ends up sitting over the same regions that received the most precipitation earlier this week, then the hydro issues in SoCal will more more severe and widespread. For now, we’ll just have to wait and see. But it is worth noting that some of the more extreme model projections from last week (suggesting the potential for 8-10 inches of rainfall even across the coastal plain) look quite unlikely at this point–and will probably be half that (or less). After this week’s storms, there is rather striking multi-model ensemble agreement (dare I say unanimity?) that a high-amplitude blocking pattern will develop across much of the Northern Hemisphere during the second half of January, and perhaps persisting for weeks (at least through mid-February). This pattern strongly resembles the “Warm West/Cool East” pattern associated with an amplification of the typical “North American Temperature Dipole” (see our formal study on this pattern from a couple years back, and/or my Weather West summary post on that research). 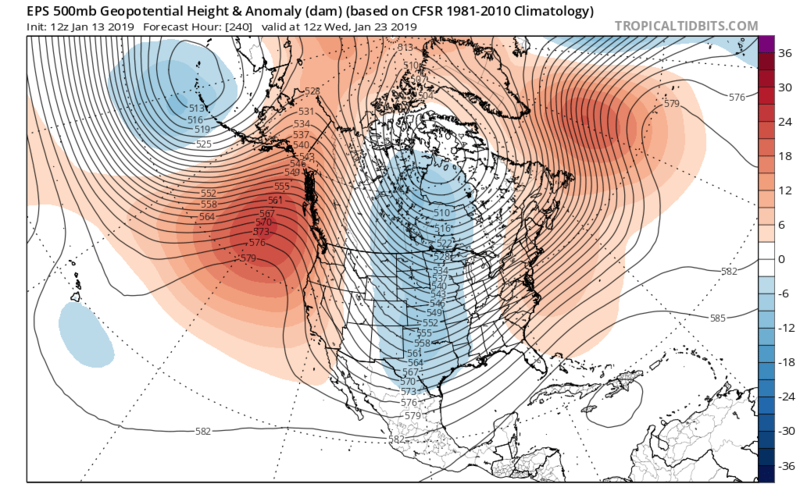 This pattern is associated with the simultaneous occurrence of unusually warm, dry, and quiescent weather across California and much of the West Coast and unusually cold, often stormy weather from the Midwest to the Eastern Seaboard. 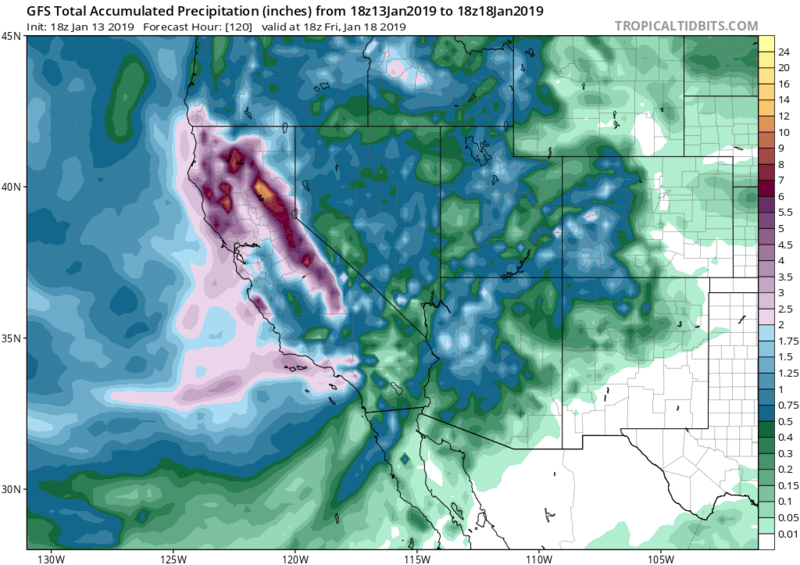 In this case, it does appear that California will rapidly dry out after this week’s storms and will enter a prolonged warm/dry period for the foreseeable future thereafter…so let’s keep our fingers crossed for as much moisture as possible this week. Why are all the global models suddenly locking onto this very specific pattern so far into the future? It is a bit unusual, especially since the models have recently been out of phase and predictability beyond 10-14 days is often quite low. But in this case, there may be a fairly clear cause of the consensus: the recent stratospheric sudden warming (SSW) event, followed by a breakdown of the stratospheric polar vortex, is now slowly beginning to “couple” with the troposphere below (i.e., the layer where all our weather happens). As this occurs, lobes of cold polar air become displaced to lower latitudes and induce a very wavy pattern in the jet stream–setting up persistent ridges (blocks) and downstream troughs in preferred locations. Unfortunately, California and the West Coast are often at the longitude of a preferred ridge when there is a significant perturbation to the hemispheric flow pattern–and that appears to be the main cause of the projected upcoming ridge pattern. There are currently indications this pattern could persist for 4 weeks or more, but I’ll revisit this notion in the next blog post. Stay tuned!